Stop putting it off! Let the experts show you the simple way to resume success. All of your educational, professional, and personal accomplishments will not help you get a job if you cannot condense that information into a concise, polished resume. And while you may think resume writing is not one of your strengths, it's the skill that will do the most to get you to the next step - the job interview. With so much riding on the resume, you need help from the experts. Just follow the simple steps in the PLA's revised "Guide to Basic Resume Writing" and in no time you'll produce a document that skillfully summarizes your qualifications and separates you from the rest of the pack.Whether you're changing careers, re-entering the job market, or looking for your first job, this comprehensive guide will show you how to: present your educational and work experience in a way that highlights your specific job qualifications; use direct, active language to showcase your communication skills; prevent potential pitfalls that could land your resume in the circular file; draw from dozens of sample resumes - including Spanish-language examples - to construct a template that works for your needs; impress your potential employer at first glance with professional quality proofreading, formatting, and printing; keep your name on the short hiring list with effective cover letters and follow-up correspondence; create a scannable resume for electronic submission. In today's tight job market, a well-written resume can mean the difference between professional success and the unemployment line. 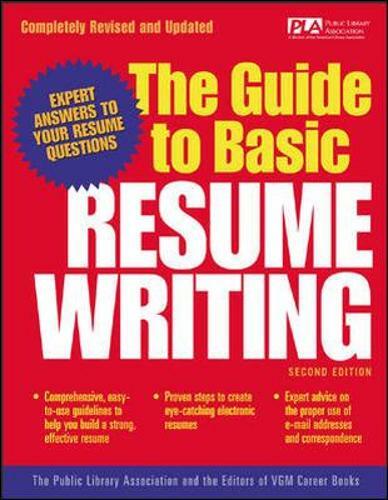 Give yourself a competitive edge with "The Guide to Basic Resume Writing."